Chalo Chatu is a free online collaborative encyclopedia by the Chalo Chatu Foundation. 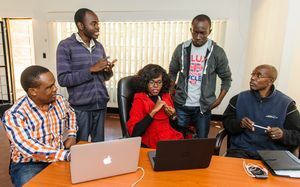 Launched on 1 June 2016, the website aims to be a knowledge hub that will preserve the History and Pride of Zambia. We are a non-profit organisation and content on this website is contributed by volunteers. 8 Are you closely connected to the article topic? Documenting an entire nation is no easy task! Because of that, we have a number of passionate writers and contributors who have voluntarily come on board to gather information from various locations of the country. Refer to the section below on how you too can contribute and help build this encyclopedia for this generation, and the generations to come. Anyone who is registered to the site can contribute to Chalo Chatu by clicking on the Edit tab in an article. It is important to realize that in contributing to Chalo Chatu, users are expected to be civil and neutral , respecting all points of view, and only add verifiable and factual information rather than personal views and opinions. Once the contributor has decided a topic of interest, they may want to request that the article be written (or they could research the issue and write it themselves). The ease of editing Chalo Chatu results in many people editing. That makes the updating of the encyclopedia very quick, almost as fast as news websites. Are you passionate about documenting Zambia? Good! You can join our team of volunteers and help this website grow. Simply request for an account and we will be happy to have you on board as a contributor! Or, if all you want to do is send us a piece of information that you feel would be of interest to society, feel free to e-mail it to us at contribute@chalochatu.org. You can think of a topic to write about, or check through our list of wanted pages. You have probably already edited blogs or social media sites. Maybe you have already made minor edits to our articles – but now you want to start your own article from scratch. Jump in! We'll explain some of the DOs and DON'Ts, then show you how to create an article. If the article is not acceptable, it will be deleted quickly. All new articles are patrolled shortly after creation. Articles that do not meet notability guidelines or do not cite reliable published sources are very likely to be deleted. Do not create: pages about yourself, your company, your band, or your friends; pages that advertise; personal essays; or other articles you would not find in an encyclopedia. Be careful about the following: copying things, controversial material, extremely short articles, and local-interest articles. First Consider registering an account. Chalo Chatu covers certain kinds of subjects in Zambia and not others. Our articles must be "worthy of notice"; this avoids filling Chalo Chatu with pages that are not really meant for this Zambian encyclopedia. If the topic is suitable for Zambian encyclopedia, go ahead; if you're unsure, or the article is about yourself or something you are closely connected to, you can ask questions at the contribute@chalochatu.org. Search Chalo Chatu first in case an article already exists on the subject, perhaps under a different title. If the article already exists, feel free to make any constructive edits to improve it. Practice first. Before starting, try editing existing articles to get a feel for writing and for using Chalo Chatu's mark-up language, experiment first on your own user page. Gather references both to use as source(s) of the information you will include and to demonstrate the notability of your article's subject matter. Chalo Chatu requires the use of reliable published sources. Sources, particularly internet sources, should also be stable, meaning they should be high enough quality that they will continue to exist for future generations. There are many places to find reliable sources, including your local library, but if internet-based sources are to be used, start with books and news archive searches rather than a simple web search. Extra care should be taken to make sure that articles on living persons have reliable sources – articles about living people without reliable sources may be deleted, especially if they include negative or controversial content. References to blogs, personal websites, Facebook and YouTube are unsuitable and material obtained from them may be challenged and removed. Create the article first in Draft or User space unless you are very sure that you can create an acceptable article on your first attempt. Draft space has been a safe place to create articles that you want to work up towards being accepted into the encyclopedia. 'Live' articles are required to meet a number of Chalo Chatu rules from the start, or they risk being deleted; but in Draft space, unless you do something seriously bad (like a copyright violation, or a personal attack on somebody) nobody is likely to touch your draft unless you ask them to. Chalo Chatu already has 1,345 articles. Before creating an article, try to make sure there is not already an article on the same topic, perhaps under a slightly different name. Search for the article before creating your first article. If an article on your topic already exists, but you think people might look for it under some different name or spelling, create redirects to alternative titles; adding needed redirects is a good way to help Chalo Chatu. If a search does not find the topic, consider broadening your search to find existing articles that might include the subject of your article. For example, if you want to write an article about a band member, you might search for the band and then add information about your subject as a section within that broader article. Gather sources for the information you will be writing about. To be worthy of inclusion in an encyclopedia, a subject must be sufficiently notable, and that notability must be verifiable through citations to reliable sources unless in special cases for example freedom fighters and national history not documented but is verifiable with the general public. As noted, the sources you use must be reliable; that is, they must be sources that exercise some form of editorial control and have some reputation for fact checking and accuracy. Print sources (and web-based versions of those sources) tend to be the most reliable, though some web-only sources may also be reliable. Examples might include (but are not limited to) books published by major publishing houses, newspapers, magazines, peer-reviewed scholarly journals, websites of any of the above, and other websites that meet the same requirements as a reputable print-based source. In general, sources with no editorial control are not reliable. These include (but are not limited to) books published by vanity presses, self-published 'zines', blogs, web forums, usenet discussions, personal social media, fan sites, vanity websites that permit the creation of self-promotional articles, and other similar venues. If anyone at all can post information without anyone else checking that information, it is probably not reliable. To put it simply, if there are reliable sources (such as newspapers, journals, or books) with extensive information published over an extended period about a subject, then that subject is notable and you must cite such sources as part of the process of creating (or expanding) the Chalo Chatu article. If you cannot find such reliable sources that provide extensive and comprehensive information about your proposed subject, then the subject is not notable or verifiable and almost certainly will be deleted. So your first job is to go find references to cite. There are many places to find reliable sources, including your local library, but if internet-based sources are to be used, start with books and news archive searches rather than a web search. Chalo Chatu content is intended to be factual, notable, verifiable with cited external sources, and neutrally presented. Normally editing is chosen by clicking the Edit tab at the top of a Chalo Chatu page (or on a section-edit link ). This will take you to a new page with a text box containing the editable text of the page you were viewing. In this box, you can type in the text that you want to add, using wiki markup to format the text and add other elements like images and tables. You should then press the Show preview button to review your contributions for any errors. When you have finished editing, you should write a short edit summary in the small field below the edit-box describing your changes before you press the Save page button. This will help others to understand the intention of your edit. To avoid accidentally leaving edit summaries blank, you can select "Prompt me when entering a blank edit summary" on the Editing tab of your personal preferences. An edit summary is a brief explanation of an edit to a Chalo Chatu page. When you edit a page, there is a small text entry field labeled Edit summary located under the main edit box and above the Save page button. It is good practice to fill in the edit summary field, or add to it in the case of section editing, as this helps others to understand the intention of your edit. Edit summaries are displayed in lists of changes (such as page histories and watchlists), and at the top of diff pages. It is considered good practice to provide a summary for every edit, especially when reverting (undoing) the actions of other editors or deleting existing text; otherwise, people may question your motives for the edit. Edits that do not have an edit summary are more likely to be reverted, because it may not be obvious what the purpose of the edit was. Accurate summaries help other contributors decide whether it is worthwhile for them to review an edit, and to understand the change should they choose to review it. When a major edit (e.g. deletion of a substantial amount of text, a significant addition, or a substantial rewrite) doesn't have an edit summary, there are fewer reasons to assume good faith and busy editors may be more inclined to revert the change without checking it in detail. Summaries are less important for minor changes (which means generally unchallengeable changes such as spelling or grammar corrections), but a brief note like "fixed spelling" is helpful even then. To avoid accidentally leaving edit summaries blank, you can select "Prompt me when entering a blank edit summary" on the Editing tab of your user preferences. Summarize. Summarize the change, even if only briefly; even a short summary is better than no summary. Explain. Give reasons for the change, if you think other editors may be unclear as to why you made it. Abbreviations. Abbreviations should be used with care. They can be confusing for new contributors. For an explanation of some commonly used abbreviations, see this edit summary legend. Expand on important information. Readers who see only the summary might not get the entire picture. Prevent misunderstanding: If an edit requires more explanation than will fit in the summary box, post a comment to the article's talk page to give more information, and include "see talk" or "see discussion page" in the edit summary. If you are copying text within Chalo Chatu, you must at least put a link to the source page in the edit summary at the destination page. Talk pages. When editing talk pages, consider copying your comment to the edit summary, if it is brief; this allows users to check Recent changes, Page history and User contributions (see below) very efficiently. Avoid misleading summaries. Mentioning one change but not another one can be misleading to someone who finds the other one more important. You could add something like "and misc." to cover the other changes. Avoid vagueness. While edit summaries can be terse, they should still be specific. Providing an edit summary similar to "I made some changes" is functionally equivalent to not providing a summary at all. Avoid inappropriate summaries. You should explain your edits, but without being overly critical or harsh when editing or reverting others' work. This may be perceived as uncivil, and cause resentment or conflict. Explain what you changed, citing the relevant policies, guidelines or principles of good writing, but do not target others in a way that may come across as a personal attack. Avoid incivility. Snide comments, personal remarks about editors, and other aggressive edit summaries are explicit edit-summary "don't's" of the Chalo Chatu Civility policy. Proper use of edit summaries is critical to resolving content disputes. Edit summaries should accurately and succinctly summarize the nature of the edit, especially if it could be controversial. If the edit involves reverting previous changes, it should be marked as a revert ("rv") in the edit summary. After you save the page, you cannot change the edit summary, so be careful with it, particularly if you are in a heated content dispute – do not write things you will regret. If you make an important omission or error in an edit summary, you can correct this by making a dummy edit (a change in the page with no visible effects), and adding further information in its own edit summary. In the extreme case of an edit summary containing certain kinds of harmful content, the summary can be deleted on request. They may be removed from public view by administrators using Revision Deletion; such edit summaries remain visible to administrators. In even more limited circumstances the entire edit may be oversighted, leaving it and its edit summary visible only to the handful of users with the Oversight permission. Limited to 250 characters. The edit summary box can hold one line of 250 characters. If you attempt to type or paste more, only the first 250 characters will be displayed – the rest will be discarded. For example, attempting to add 10 new characters (at the end or in between) to a summary already containing 245 characters will result in the first 5 new characters being inserted and the second 5 being disregarded. Show preview. The "Show preview" button also provides a preview of the edit summary to facilitate checking links. Can't be changed after saving. After you save the page, you cannot change the edit summary. Doesn't appear in searches. The built-in search function cannot search edit summaries, and they are not indexed by external search engines. Wikilinks always rendered; other wikitext coding ignored. Edit summaries render internal links, including piped links, and interwiki links, even when enclosed within <nowiki> and </nowiki>. Therefore, copying wikitext in the edit summary box may be preferable to copying text from the preview, except when one wants to save space. Other wikitext coding is not interpreted. ~~~~ has no effect, so do not sign edit summaries. List of new pages – shows the edit summary of the creation. When adding a new section to a discussion page with the "new section" button, the section title is used as the edit summary. When editing an existing section, the section title is inserted at the beginning of the edit summary, enclosed with /* and */ marks, for example /* External links */. Details of the edit should be added after this text. In the case that you provide a long summary yourself, you can delete the section title in order to stay within the limit of 250 characters. When viewing such an edit summary, the section name will appear in grey, with a small arrow next to it: →External links. Click the arrow to view the section (if the section no longer exists, the link will simply take you to the top of the page). If you create a new section before or after an existing section by clicking a section "edit" link, delete the text between /* and */ marks (or change it to the new section title) to avoid confusion.<ref>It used to be possible to manually include links to multiple sections using the /* */ syntax – this may be useful when editing several sections at once. In certain circumstances, an automatic summary is generated when an edit is saved without one. This is slightly different from the summary added when editing a section, as that can be modified by the user before saving. With the exception of the automatic summary when creating a redirect, which usually says all that needs to be said, these are not a substitute for a proper edit summary – you should always leave a meaningful summary, even in the above cases. They are, however, useful in providing some context for edits made by inexperienced users who are not aware of the importance of edit summaries, and for spotting vandalism. When starting a new thread on a talk page by using the "New section" tab, the text you type into the "subject/headline" field becomes both the heading of your discussion topic, and the edit summary for that edit. Tags (i.e., edit tags) are brief messages that the software automatically places next to certain edits in histories, recent changes and other special pages. They are implemented by the edit filter to help assist vandalism patrollers and other page watchers. They cannot be added or removed manually. If you are worthy of inclusion in the encyclopedia, let someone else add an article for you. Putting your friends in an encyclopedia may seem like a nice surprise or an amusing joke, but articles like this are likely to be removed. In this process, feelings may be hurt and you may be blocked from editing if you repeatedly make attempts to re-create the article. These things can be avoided by a little forethought on your part. The article may remain if you have enough humility to make it neutral and you really are notable, but even then it's best to submit a draft for approval and consensus of the community instead of just posting it up, since unconscious biases may still exist of which you may not be aware. Please do not try to promote your product or business. Please do not insert external links to your commercial website unless a neutral party would judge that the link truly belongs in the article; we do have articles about products like Boom or Vitumbuwas, or notable businesses such as Hungry Lion, but if you are writing about a product or business be sure you write from a neutral point of view, that you have no conflict of interest, and that you are able to find references in reliable sources that are independent from the subject you are writing about. Material that violates our biographies of living persons policy or is intended to threaten, defame, or harass its subject or another entity is not permitted. Unsourced negative information, especially in articles about living people, is quickly removed, and attack pages may be deleted immediately. Chalo Chatu surveys existing human knowledge; it is not a place to publish new work. Do not write articles that present your own original theories, opinions, or insights,even if you can support them by reference to accepted work. A common mistake is to present a novel synthesis of ideas in an article. Remember, just because both Fact A and Fact B are true does not mean that A caused B, or vice versa (fallacies). If the synthesis or causation is true, locate and cite reliable sources that report the connection. People frequently add pages to Chalo Chatu without considering whether the topic is really notable enough to go into the Zambian encyclopedia. Because Chalo Chatu does not have the space limitations of paper-based encyclopedias, our notability policies and guidelines allow a wide range of articles – however, they do not allow every topic to be included. A particularly common special case of this is pages about people, companies, or groups of people, that do not substantiate the notability or importance of their subject with reliable sources, so we have decided that such pages may be deleted. This can offend – so please consider whether your chosen topic is notable enough for Chalo Chatu, and then substantiate the notability or importance of your subject by citing those reliable sources in the process of creating your article. Chalo Chatu is not a directory of everything in Zambia. Articles need to have real content of their own. Are you closely connected to the article topic? Cite secondary sources (e.g., a major media article) for any new statements you add – even if you are confident a statement is true (e.g., it is about your work), only say it if it has been restated already in a secondary source. If you are biased, suggest new article text or edits on the article talk page (not on the main article page). Disclose your relationship to the client/topic. Recruit help: Seek out a sponsor (volunteer editor) who has worked on similar articles, or submit ideas for article topics via contribute@chalochatu.org. Technology: Servers, bandwidth, maintenance, development. To support our rapidly growing website and vast information, Chalo Chatu runs on a large server that comes with high monthly and yearly costs. Projects: In order to research and gather information on various topics from all parts of the country, we incur logistical costs such as travel and internet bandwidth. The project currently does not have its own equipment and has been relying on individual volunteers to use their own equipment, such as computers and cameras, to gather information. This has, however, proven difficult for those that don't have their own. Stay updated with our daily posts and conversations by following our hashtag #ChaloChatu on all our social media channels. ↑ Use the enhanced watchlist to see all recent changes in the watched pages, not just the last change in each page. This page was last edited on 8 January 2018, at 07:26.